The Montreal trio's latest album shows an increasingly refined sense of knowing when to nurture one impulse and temper another, embracing compromise without sacrifice. 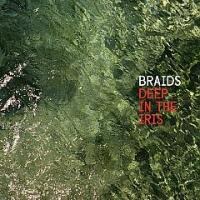 Braids have been no less hesitant to engage directly with their influences than they have been to move beyond them. There were some overt Animal Collective-isms of their debut, Native Speaker, but they were all but entirely put to bed by the time the album was shortlisted for the Polaris Music Prize in 2011. Flourish // Perish was a polar shift in tone and temperature, swapping Native Speaker's sweaty physicality for a presence that summoned every available synonym for ice. The irrepressible collegiate energy embodied by Raphaelle Standell's visceral howl on songs like "Glass Deers" was largely tamed on Flourish // Perish, save for a few exceptions like "Ebben" and the final salvo, "In Kind". Along with those two standout tracks, "December" laid out a new blueprint for Braids, who were by that point a trio after the departure of keyboardist Kate Lee. A twilight tryst between feverish Feels-style propulsion and the stark timbres of Björk's Vespertine, especially notable in the closeness of Standell's delivery. Though live drums appeared consistently on Flourish // Perish, other traditional tools were swapped for digital twitches, snags, and stomps. Only several months before in that same year, Standell's other endeavor, Blue Hawaii, had released their album Untogether, and the distance between the two projects seemed to be closing fast. Untogether was, by a matter of one or two degrees, less engaged with finding hooks than with selecting the most intriguing corners in which to look for them, but both projected cool demeanors while they waded up to their hips in intricate, fidgety production. Not two full years on from Flourish // Perish, and Braids appear inclined to put a little space between themselves and all the “cold” analogies. Trading a stark grey image of water for a warm green one for their new album's cover – or what can appear to be a topographical view of a mountain range, depending on how hard you squint – is only one of the more obvious gestures in that direction (as is naming a song "Warm Like Summer"). Mountains actually served as the backdrop for the creation of Deep in the Iris. To begin the process, Standell, Austin Tufts, and Taylor Smith visited out-of-the-way places in upstate New York, Vermont, and even Prescott, Arizona. According to the band (via a post on its website), they did this not purely to crank out new material, but to spend time "breaking down barriers of self-scrutiny, judgment, expectations, pushing to be raw and vulnerable in front of one another, [and] focusing on process rather than goal." Retreating to rural locales in order to disconnect from the unceasing buzz of civilization and process personal experiences is a time-honored tradition in modern music. If these team building retreats worked to bring the three of them closer together as a unit then that is all for the better, but being able to fully express their ideas hasn't, from the outside looking in, appeared to have been one of Braids' weak spots. Though interpersonally the three may feel more liberated than ever, they are also developing an appreciation for employing a measure of restraint. The songs on Native Speaker had little regard for the time constraints of the pop attention span, often clocking in around the eight-minute mark, feeling out every potential crescendo and muted passage in real time. Flourish // Perish reigned it in length-wise for its first half, but Deep in the Iris goes all in on folding their sound into more marketable structures. By doing so, Braids have hit upon a formula that could continue to work for them for some time to come, if they allow it to. In particular, the rush of striking playlist oil on that middle ground is palpable on "Taste", the lead track released from the album. “Taste” assuredly shows Braids can do pop, but it still has to be largely on their terms: forthrightly confessional enough to make one squirm, partially culled from dream journals, and something less than optimistic about love's healing potential. "Take me by the throat / Will you push me up against this wall / And spit all your hurt on me / So I can feel my reach", Standell searches, before summing up both the promise and the problem: "We experience the love that we think we deserve." "Miniskirt" is both more personal and universal; a breakdown of the disparity in how society perceives sexual experience, and the stigmas forced upon women as a result. Standell succinctly picks apart the perspectives that somehow still hold on in these supposedly enlightened times: "For us it's just a stamp to the head / For them another notch in the bed / It's like I’m wearing red / And if I am / You feel you've the right to touch me / Cause I asked for it." The rallying thrust of the opening mission statement "Letting Go" and the racing closer "Warm Like Summer", elevated by Standell sounding more centered and soulful than ever, get their due prominence, but the quieter introspective narrations of "Happy When" and "Getting Tired" are no less central to a record with very few, if any, truly weak spots. It is an all-laid-bare personal document that can be just as meaningfully experienced in a room full of others. Deep in the Iris doesn't completely dissolve Braids' diverging impulses into one another, but it knows when to nurture one and temper the other, embracing fair compromise without unfair sacrifice.